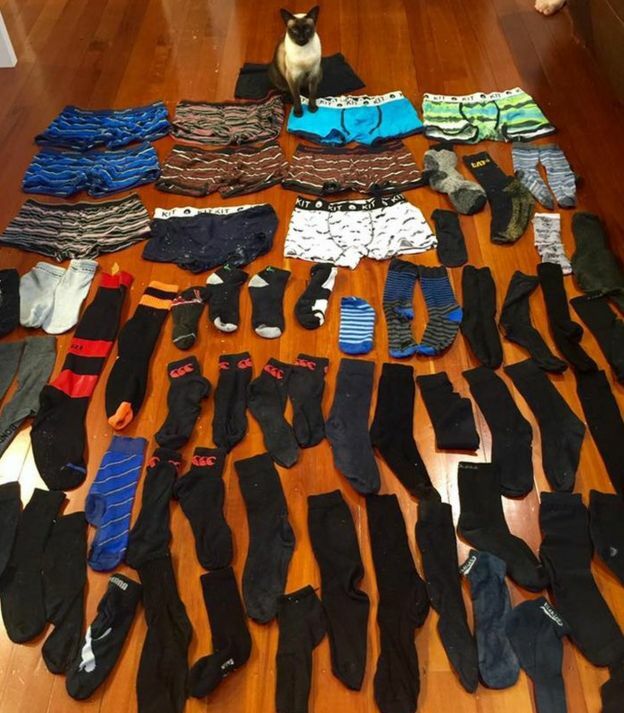 A nocturnal "cat burglar" has been stealing dozens of socks and men's underwear in New Zealand. In two months, six-year-old Tonkinese cat Brigit from Hamilton city brought back 11 pairs of underpants and more than 50 socks. Her owner, Sarah Nathan, has documented her feline's strange obsession on a widely shared Facebook post. "Now it's getting silly. Someone must be missing this stuff," she said in a post shared close to 500 times. Ms Nathan told the BBC that the trouble first began when she started discovering "odd pieces" of underwear among her washing. "They didn't belong to anyone in the house and one day Brigit walked into our lounge carrying a sock like a kitten," she said, adding that Brigit's unlucky victims were probably a nearby flat "full of blokes". The family said it has also started distributing street flyers. "Keeping cats indoors isn't common in New Zealand," said Ms Nathan. "Brigit doesn't hunt birds or wildlife so it seems unnecessary and our neighbours have been very good natured about it. "But we are moving to the country soon so hopefully she will run out of opportunity!" Not an isolated incident, my coworker was at her neighbours house for dinner one night and the neighbour's cat came home dragging a half cooked steak he had pinched off someone's bbq! mmmm... now this might explain why i found a couple of my socks outside the back gate the other day. Looks like mainly mens gear this Kiwi puss was after... lol story! My old cat came home with a baby rabbit once, it was luckily unharmed and I got it off him and returned it to the owner across the road whose bunny had recently had kits! Cats are not just weird, they are insanely insane..... but that's why we love them, eh? My Thomas & Twinkles used to be a right pair. Twinkles was so grumpy at Tommy all the time but he always tried to be friendly with her. He was brave and adventurous and she was scared of her shadow. He'd go off hunting and bring her presents, put it down in front of her and then watch her figure it out... on my living room rug a live garter snake, mice, and yes some bunnies too. Twinkles would poke at them a bit then Tommy would zip off again outside to find something new. I love Thomas! The stories I have heard about him (especially the mattress bit... he was just such an awesome cat and funny!! !lol) Love to Twinkles too of course though.. Yes my little chap loves the fresh laundry too!